Back in March, there was a Tornado over here in Greymouth, (on the West Coast of the South Island of New Zealand) and here are a few pictures of the damage to the towns Electrical system. Allthough I have seen this many times from many different tornadoes, I am still in awe of their power. The power of wind or water, is terrifying,considering how powerless we are to stop it. That last one is too much! Isn't that why the "storm test" building extieriors by shooting a 2X4 out of a cannon. Even loose change is like bullets. Supposedly even pine-tree needles caught in a tornado are like someone flinging knives or darts at you. "It's a bit of a mess"
When I was on holiday in Florida last year hurricane charlie hit, I cant beleive the power of these things. I've only ever been to Greymouth once or twice and I didn't take a lot of notice of the linework there at the time, but if my eyesight isn't playing tricks on me, that pole in the second picture (2nd pole back) is in the middle of the foot-path (side-walk). In that same pic, on the nearer pole, that's actually someone's mailbox hanging off the top 11kV wires. Another thing, the local Lines Company would be looking to get the poles replaced and the lines back up in the air,otherwise all that good copper could very well find a new home over night. Just goes to show what sort of loading power lines can put on a reinforced concrete pole, though. 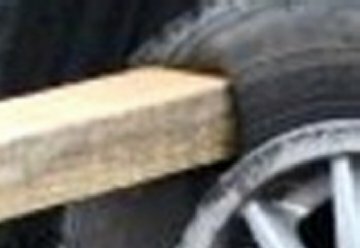 When I first saw that bottom picture of the 4x2 in the car tyre, I thought that that pic had been Photo-shopped and I'm still of that opinion, the edges of the tyre where the wood enters are much too straight, shouldn't they be "caved-in" around the timber edges?. That last photo could be photo-shopped, Mike. I've seen & heard of grass & straw going into things you wouldn't think possible-like telephone poles. The strangest thing I see with tornados is a house demolished right next to one that's untouched. I did a clean-up when I was a boy scout & saw a small strip of grass torn up by the tip of the tornado. The house near it was demolished. I hope you're having a nice fall. We're having a wonderfully long spring here. Usually spring is only a few weeks, then it gets hot.